Today's post is a twofer. You get the winner's name for the above prize, and the announcement for next week's giveaway all in one post. I'm overstocked and must make room for new products coming in, so next week's giveaway will help me clear out the warehouse (aka my kid's bedroom!). Finally, I can't leave out my big dog buddies. After all, the gator in the warehouse (you know this is Florida, right?) was probably responsible for the missing cans in the carton of food that is prize #2! So, I guess it's time to get rid of this big boy. One lucky owner of a medium to large-sized dog will take home the Plush Puppies Large Gator toy made by Kyjen. This toy features a whopping 16 squeakers inside. Disclaimer: I do not supply earplugs or take responsibility for any hearing loss. Supervise your dog carefully while he plays with squeaker toys, and wear earplugs for your own protection. To enter, you can comment here, on my Facebook page, or through a @Tweet. Don't forget to "Like" us on FB so you won't miss any big prize news, and follow us at Twitter too. To win, you MUST tell me about your dog--big or small? Large and Medium-sized dogs will go into the drawing for the gator toy. Toy-sized dogs get an entry for the Cesar Cuisine. After all, this gator is about 2 feet long--bigger than your average dog toy, by far. Do you want to see this fella? Hangs Down Another 6 Inches! The winner of this week's Dog Lover's Giftpack is "Cstironkat". I have no clue how to pronounce that, but fortunately he/she left contact information so I can get in touch. Congratulations! 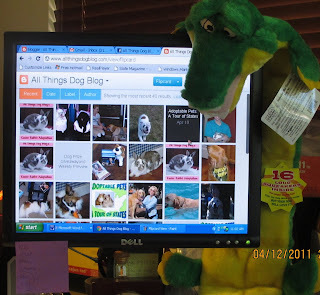 Can I try to win the gator for my two Alaskan Malamutes? I'm not sure if you allow someone to win more than once. Congratulations cstironkat! You're welcome to enter as many giveaways as you wish. Your name will continue to be placed in the prize name box. I may be drawn at any time in the future. My dogs have been wanting to try out one of those toys, and at 33 lbs and 45 lbs, they are certainly big enough to get lots of enjoyment out of it! Thank you for letting me enter for the gator! It big enough for my dogs to play with it together. $/16 entry for the huge croc! 4/18 entry for the huge croc that my dogs are crossing their paws for. 4/19 My dogs would be so excited with all those squeakers. I would love to win this for my dog Scotty, who is a miniature schnauzer. He is a small dog =). Today's entry for the big dog squeaky toy. My dogs are crossing their paws. 4/21 entry for the giant croc, I would love to see my dogs' reaction to this giant toy. i love that! i have a japanese akita, tika! She would just adore this gator!